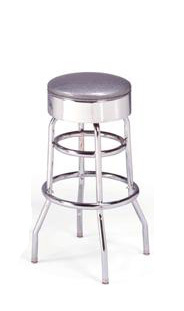 Model B1T2 retro barstool features a double ring base with revolving smooth chrome seat and chrome finish. Available in your choice of standard and designer vinyls. Rated for up to 400 lbs. and carries a lifetime structural warranty. All our barstools are made in the USA, and built to last!